“The student body has exploded,” said Jason Crippen, a special education teacher at East and one of Kurtis’ instructors. Laurel Scott, another East teacher and the prom sponsor, agreed. Kurtis, who teachers say is well-known and liked at East, learned of his nomination on April 4. He echoed his excitement with a quick “Happy!” and a grin when asked this week how he felt about the honor. As prom approached and students cast their votes for king and queen, the buzz about Kurtis’ nomination caught on at school. A few students made him campaign posters. Teachers and his classmates wore suit jackets and ties. Then junior Kylee Jarrett, a teacher’s aide in Crippen’s class, decided to help spread the word by making a campaign video. The video — a 61-second clip of Kurtis and other special education students dancing to Justin Timberlake’s “Suit and Tie” — was posted on YouTube on Monday morning. By Friday evening, the video had been viewed more than 1,500 times, including classroom viewings at East and in a commons area. Chuckling, George Depew admitted Kurtis is stiff competition. 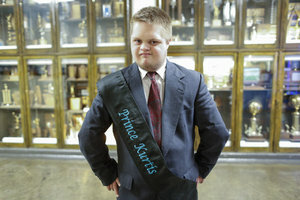 The senior said he “just kind of gave up for my own chances” to be named prom king after the video came out. “I’m telling all my friends to vote for Kurtis,” Depew said, smiling when Kurtis murmured appreciation for the support. Most of the others elected to prom court are doing the same, he said. Fifteen students — seven girls and eight boys — are in the running. “You got to love a guy who wears a suit every day,” Depew said. East High’s prom will be held Saturday at the school. Votes will be tallied by about 9:30 p.m., said Scott, the prom sponsor. The king and queen should be named by 10. Other candidates for king are seniors Nolan Badgett, Matthew Clough, George Depew, Jake Faflick, Charlie King, Andrew Koehler and Kevin Wong. Candidates for queen are seniors Emily Davis, Zahava Davis, Yazmin Guzman, LaRissa Lawrie, Carol Viluethpad, Haris Vrahliotis and Cate Wesselowski. “So if someone says, ‘Kurtis you’re the prom king,’ what are you going to do?” Crippen asked his student. A wide smile brightened Kurtis’ face.